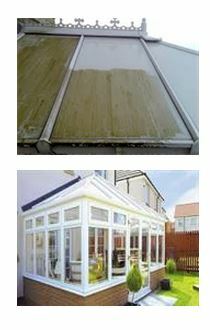 Over time your conservatory can attract algae, lichen, dirt, traffic fumes and other air-borne pollutants. These can not only make a once proud conservatory green and grimy but can actually damage Upvc frames and rubber seals. If this type of dirt and grime are detracting from its once brilliant appearance then external valet conservatory cleaning is what you need. With conservatories costing many thousands of pounds and for some people represent the largest purchase they will ever make, save for buying a house, it is essential that conservatory cleaning takes place on an annual basis. Using specialist high reach equipment Modus Cleaning Solutions will clean all of the hard to reach areas of your conservatory, which means that we can safely clean the areas that you don’t want to. Our exterior valet service includes the following aspects…. If the frames have gone grey and pitted then a Upvc rejuvenation treatment will be discussed. You will be able to proudly show off your conservatory once again after Modus Cleaning Solutions have given it a professional external valet clean. Leaving no details unchecked, you can enjoy the benefit of a comprehensive external valet makeover for your conservatory meaning that it will be sparkling clean without you lifting a finger!